While data strategies aren’t new, they sure are popular lately. HBR’s latest issue featured a piece on “Two Types of Data Strategies.” The article was full of great observations like “…less than 1% of [company] unstructured data is analyzed or used at all”, and “80% of analysts’ time is spent simply discovering and preparing data.” Sound familiar? It does to us. We frequently see trends like this in our work developing legal data strategy for legal departments and law firms. The HBR article does a great job of identifying two different types of data strategies – defensive and offensive. But it misses the point of data strategy in legal. In our experience, Chief Data Officers and VPs of Data Governance aren’t struggling to decide on their legal data strategy. They simply lack a strategy, and thus aren’t even recruiting for these positions. As usual, legal is late to the conversation, but signs are clear that legal is getting involved with data. We want to measure these market trends to help executives and strategy professionals understand their position relative to peers. Legal data strategy development is still in its infancy, but as the emergence of groups like CLOC reminds us, maturity is inevitable. To help speed this growth, we’re running an annual survey and publishing a whitepaper – the Annual Legal Data Strategy Survey. What percentage of respondent organizations think that data can improve the efficiency and quality of their organization’s work? What percentage of respondent organizations have considered developing a legal data strategy? 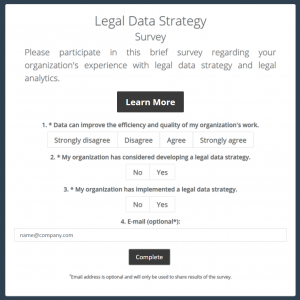 Which respondent organizations have actually implemented a legal data strategy? We want you to participate in this new project. You can take the quick, three-question survey from your phone or other device. If you choose to provide an email, we’ll only use it to share the survey’s results.